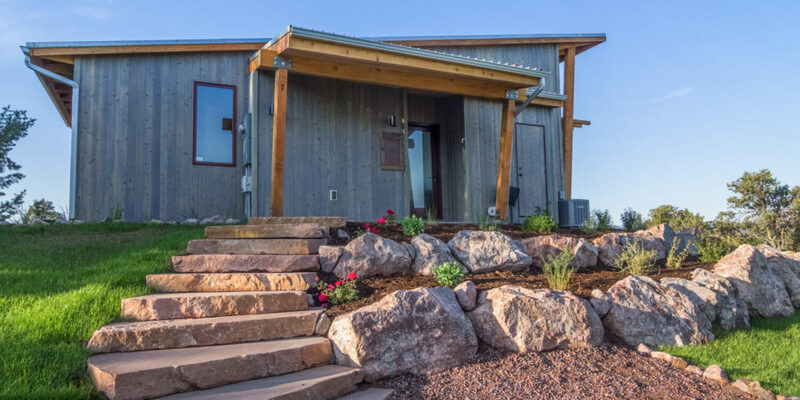 Our luxury mountain cabins have been designed to bring the Colorado mountains to each guest. To blur the line between indoor and outdoor. To let the outside in, so you can experience Colorado as it was meant to be experienced. Your luxury cabin rental will certainly have the same views as those hearty pioneers of old witnessed, but don’t think for a minute you’ll have to sacrifice modern amenities and comfort. Granite counter tops, high-end stainless steel appliances, and under-cabinet lighting are the foundation of the galley-style kitchenette. Relax in the living room on the attractive and comfortable leather couch, and soak in the warmth of your gas fireplace. Chances are you plan to spend some time soaking in the great outdoors while visiting us. After all that’s why you chose Colorado, right? Each luxury cabin rental boasts 400 square feet of covered patio designed to be a comfortable outdoor living space. The pass through indoor / outdoor gas fireplace will keep you warm on cool evenings, and the outdoor dining table and chairs are perfect for group meals on your private patio. We took pains during construction to preserve every pinion and juniper tree possible, to maintain the native high mountain vegetation. The mature trees and added tall grasses provide natural privacy while maintaining environmentally responsible landscaping. While your days may be packed with activities, there’s always time to unwind back at the cabin. We think you’ll agree we’ve thought of everything to round out your stay with us. Clean lines and simple design are the hallmark of the bathroom space. The spa-style, glass wall shower features large rainshower shower heads, floor to ceiling tile, and a large etched glass window to make the space bright and clean. A granite countertop, large vanity mirror, and soft lighting contribute to an effective use of space and design. The Single King Cabin is a luxury vacation cabin just right for couples or families of 4 with younger children. You’ll find the same well-equipped kitchenette, the same open and bright bathroom, and a pull-out sofa sleeper in living room. Families of four to six will appreciate the added space in our 2 bedroom luxury cabin rental. The master bedroom features a king bed and flat screen TV. The second story bedroom includes a half bathroom, along with a king bed.